We’ve been here for a week now. Must say this is one of the most peaceful anchorages we have been in. No sign of civilization other than the lighthouse in the distance. Flat calm, quite and dark at night. The sand flats dry out at mid tide, creating a huge sand island for Scupper to run. The only downside are the sand flies that seem to find us late afternoon. I guess because there has been no wind for the past week to keep them away. Reminds us that we need to get cockpit screening before we head to Indonesia in a few months. 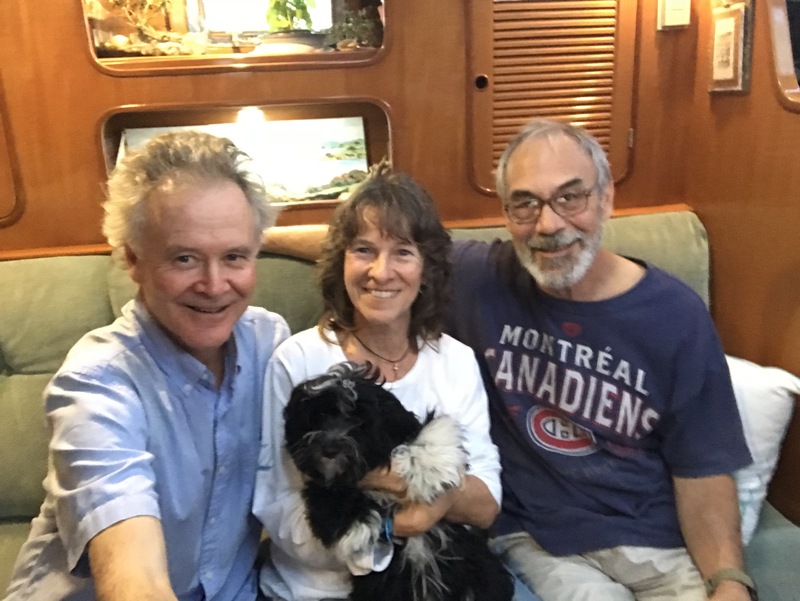 Norm, Bev and Pip on Peggy-Anne arrived mid week, so we had a couple of music nights on our boat. Pip and Scupper got on well, however Scupper would give Norm a bark every once in a while. Scupper is turning into a great little watch dog. 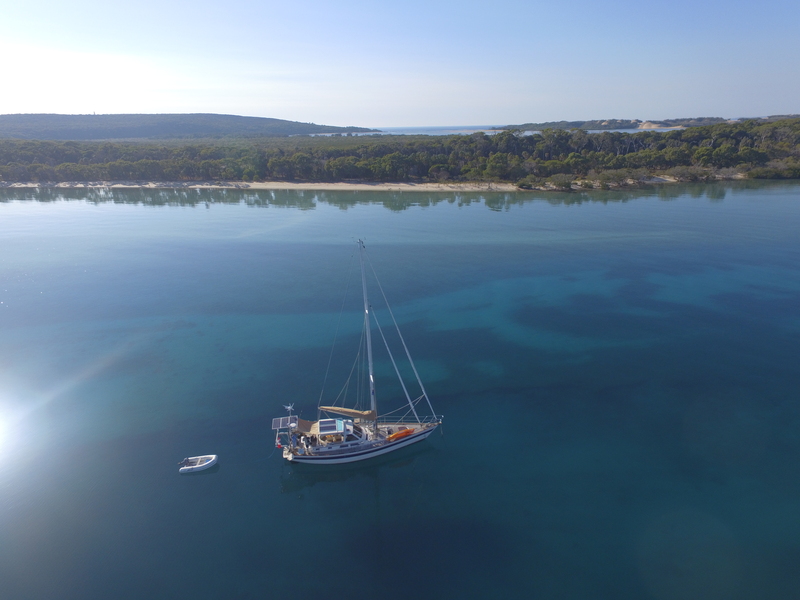 While Norm was here at the anchorage he flew his drone one day and gave us a great arial shot of Meikyo. Before we left Sydney we rented a car and did a road trip to Melbourne to pick up our life raft which we just had serviced. 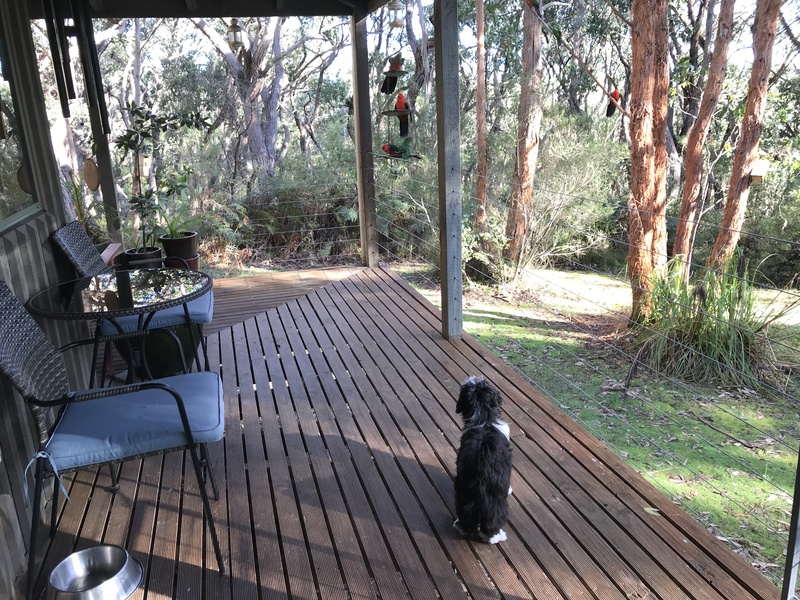 We rented a cottage (dog friendly) near Cape Otway for two nights. Wood stove fireplace, jacuzzi tub, nestled in the woods with lots of parrots. A real change from being on the boat. When we left Sydney we did overnight stops at Pittwater, Newcastle and Port Stephens as we weren’t keen to sail at night knowing there 83 shipping containers lost between Newcastle and Coffs Harbour. Didn’t see any shipping containers but we did see many Humpback whales migrating north with us. One breached quite close to the boat. We heard a loud bang and thought the mainsail had jibed. But just off our port side there was a very large splash. We had an enjoyable two week stay in Coffs Harbour. We met John, a fellow Canadian who migrated to Australia many years ago, playing at an open mic. He lent Liliane his guitar and she played four of her songs which were well received by the audience. Especially “Old Tom”, the true story of a killer whale from Eden. 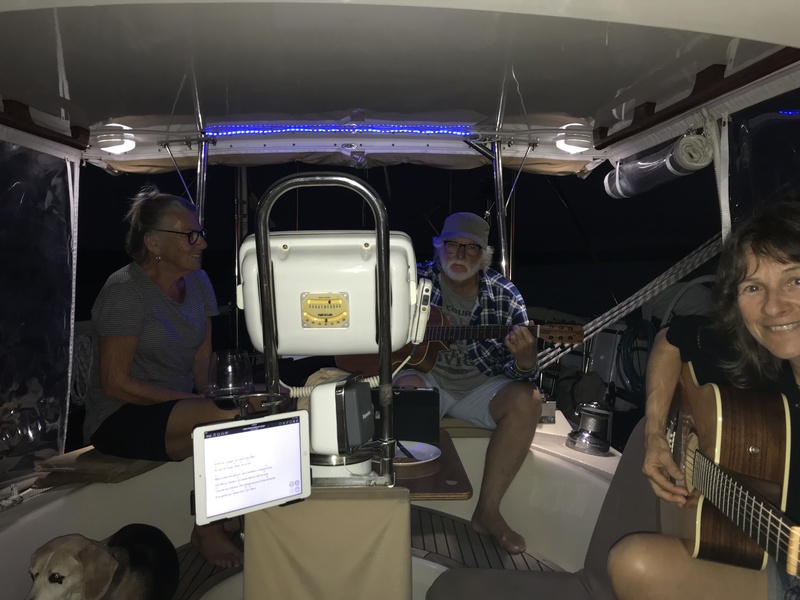 We later had John on the boat for a couple jam sessions. Great fun. From Coffs we sailed straight to Mooloolaba. There we met up again with our very good friends Sheryl and Ian. And of course Lucie and Gizmo. 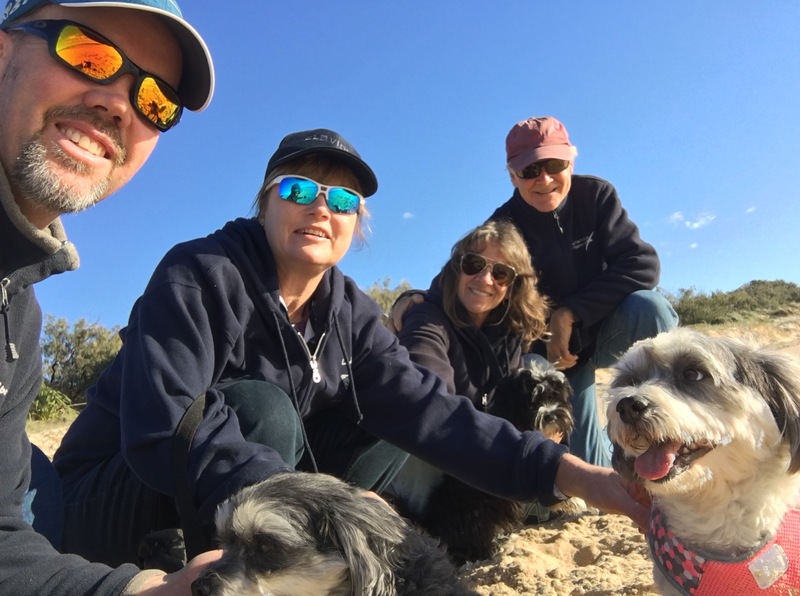 We had a great time at their place and on the Sunday took the dogs to the beach. We are anxiously waiting for them to buy their next boat so they can catch up with us. The big news is that Liliane’s first book “The Adventures of Brandy the Sailor Dog” is now on Amazon as an ebook (soon to be in print as well). Check it out. Can you still remember your previous life’s, your working life’s? Writing books, playing music…what is going on with you? Us…I am on the hunt for a sailboat!! Maybe we can, too, learn new skills, like singing or dancing or painting!! !